I had a great time at ReaderCon last weekend! The BCS reading Saturday afternoon was great. The readers included Matthew Kressel, Margaret Ronald, Marko Kloos, and Michael J. DeLuca. Margaret has another of her BCS steampunk stories forthcoming in BCS later this year, and Marko’s story “Ink and Blood” will be out in BCS #74 later in July. Thanks to everyone who spoke to me or came to the reading or snagged a flyer! I will be at ReaderCon in Boston this weekend, with a stack of shiny BCS flyers. If you see me in the halls or the pub, feel free to say hello. There is also a BCS reading, on Saturday at 2:30 PM. Authors will include Margaret Ronald, Michael J. DeLuca, Matthew Kressel, Marko Kloos, and more. If you’d like to hear some great recent and upcoming BCS fiction and meet some great young writers, drop by. 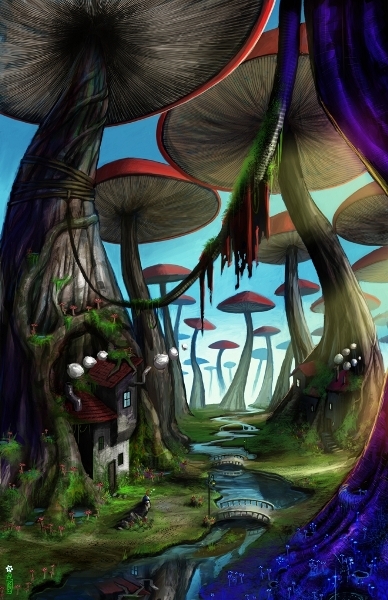 The new flyers feature our brand-new cover art that premieres with BCS #73 this week: “Mushroom Forest” by Geoff Trebs. Pretty cool! Assistant Editor Kate Marshall will be in attendance at Norwescon this weekend. You can catch her on several panels, including “Good Guys Versus the Evil Hordes” on Saturday night, with BCS author Garth Upshaw moderating. If you see us in the halls (or at the bar ), feel free to say hello! This weekend BCS will be at Boskone, the Boston-area F/SF convention. Scott will be on several panels, including one Saturday at noon on Sword & Sorcery Today. There will also be a BCS reading Sunday at noon, with authors from the magazine reading stories that will be appearing in BCS this spring. Drop by and give them a listen. And if you see us in the halls, feel free to say hello! World Fantasy went quite well. I met a bunch of BCS authors for the first time, including Marie Brennan, Vylar Kaftan, Erin Cashier, Renee Stern, Ferret Steinmetz, and more. I saw several who I know from other cons, including Matt Kressel, Genevieve Valentine, Rita Oakes, and Saladin Ahmed. I also met a bunch of fans of BCS, including two editors who’ve blogged great things about the magazine: John Klima of Electric Velocipede and John O’Neill of Black Gate. I also moderated the swords & sorcery panel and got a chance to explain the particular brand of character-centered fantasy that BCS specializes in. Judging from the recent online praise for the magazine’s second anniversary, it has found its audience. Thanks to everybody who spoke to me at the con, everybody who dropped by the BCS party , and everyone who’s enjoying the magazine. The time for the BCS reading at ReaderCon is 6pm this Friday, in the VT room (full program info and grid here). We’ll have seven, maybe eight authors (depending on rush-hour traffic! ), including Margaret Ronald, Tom Crosshill, and Matthew Kressel. Feel free to drop by and hear some great literary adventure fantasy! Beneath Ceaseless Skies author Saladin Ahmed will be reading from several of his stories this Tuesday July 6 at the regular reading hosted by the New York Review of Science Fiction. Saladin’s stories in BCS include “Mister Hadj’s Sunset Ride” and “Where Virtue Lives.” He is also a Nebula and Campbell Award finalist, and he’ll be reading alongside highly regarded author Paolo Bacigalupi. The reading is at the SoHo Gallery for Digital Art. More info and directions can be found here. Drop by and hear some really good F/SF!